By raster engraving a piece of acrylic, you can then spread a color dye powder over top the acrylic… and then run the engraving again, this time at a lower power and a higher speed. This allows you to basically melt the dye into the engraving. It’ll take a few layers to get a good and consistent color, but it really is that simple! We’re going to have to try this with the Jolly Wrencher ASAP! We find people tend to overlook the possibilities with laser cutters. Yeah they’re a bit more expensive than 3D printers, but boy can you do a lot with them! Did you know you can form basic folded acrylic parts using a laser cutter? It’s called Laser Origami… and it’s awesome. I wonder if powdered acrylic would fuse in even better than the powder coat. A piece of coloured acrylic and a fine file might be all that’s needed. And here I thought this was featuring an engraver that uses a blue laser. Maybe it could be possible to laser etch fine enough to produce iridescence. Or maybe add a static charge yo the acrylic then “knock off” the charge and then raster back over the acrylic (or oven/halogen bake) to possibly get a better finish. So a laser cutter as laser printer? Hm, I haven’t had the opportunity/pleasure of working with a laser cutter so I am not sure quite how accurate they are ‘depthwise’, but maybe someone could also come up with a thin, multi-layer set of adhesive color sheeting, translucent at the lowest layer, and then the laser could in effect do the ‘cut-outs’ ? What about three colours stacked in a laminated sheet. Have them bleed into each other. Thus creating say 256bit colour depth. You then raster scan over the image. The faster you go the less you etch, allowing you to choose the colour. They could laser until the desired hue is achieved then laser some more, burning until required brightness is met! That’s an interesting idea, but it would probably be too expensive in practice. Also, You would only be able to cut on one surface. Plus, the more I think about it, it would probably not be very scratch resistant (small scratches would show up as the top color). Some colors might be rather difficult to do. If the colors were (from surface to deep) red, green, blue; indigo would be hard if not impossible because it would require removal of the middle layer while leaving the other two. I may have the resultant color incorrect, because addition & subtraction of pigmentation is different than addition & subtraction of light frequencies (the primaries for pigments are red, yellow, blue; light is red, green, blue). Ignoring for a second the toxic issues… Couldn’t you use laser toner? If all you need is 2 colors, use “engraving plastic” – the stuff they make trophy labels, desk nametags, etc out of. The samples above are all engraved. Would a CO2 laser remove the top color layer without making a mess? Most engravers plastic on the market today has a very thin cap (the top colored layer) and is designed for laser use, though one can still find the older engravers plastic that has a thicker cap and is designed to be cut. The laser version can also be used in older rotary equipment, but the older stuff doesn’t work well in lasers, and has a tendency to warp or burn. It’s seems like you could do SLS to get this effect. 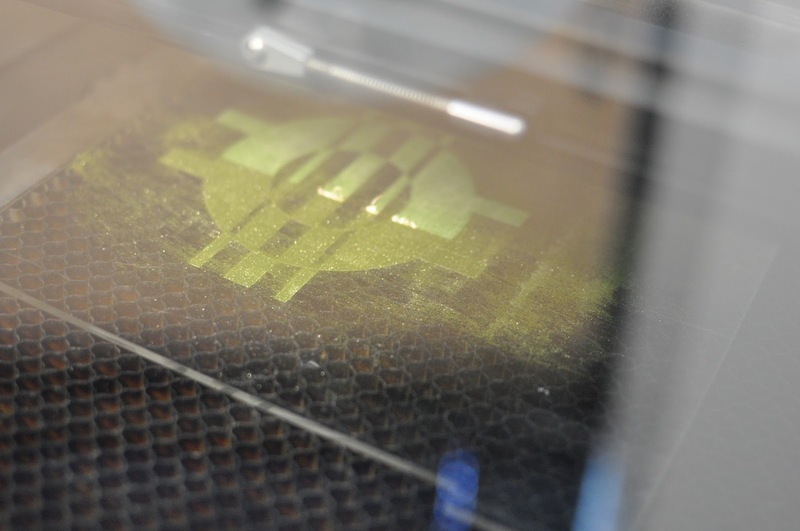 Turn the laser power way down, spread your color powder layer on top of the substrate layer, and use the laser to melt the color down onto the substrate. I would think you would need a short pulse laser to ablate the color layer from that engraving plastic without a large heat affected zone and porous re-melt of the kerf. This is SLS if you think about it. You could build up micro structures or textures if you run enough layers over and over again. I have done simple nameplates on acrylic with with powder coat material (like they use on metal) and an 808nm fiber coupled laser diode. It works pretty well. There is another material for laser engraving called ColorCast from Rowmark. There’s a thin color layer on the BACK of the sheet of clear (1/8″ or 1/4″) material. You engrave the back side with a reverse image which leaves a frosted clear area. Perfect to put LEDs behind for indicators. But you can also paint the engraved areas. It doesn’t need to be a perfect job as the panel is opaque except where the back layer has been engraved. A wide brush to fill the engraved area and a little more is all that’s needed. I used three different paint colors to color-code my labels. Looks neat, this allows clear acrylic with selective color. I’ve lasered color before by spray painting the backside black (or any color), then lasering in reverse through the paint and spraying a different color. This can be repeated many times with different colors, which would give the result of a black background with colored objects – with a very glossy front face, which is great for control panels and such. I thought this was already being done? It’s called LaserDARC and it’s been used on wood and acrylics afaik. Yeah, it has been around for a while. For stainless steels and aluminum we use a product called Cermark, and there is an equivalent product called Thermark. I tried it and I have problems. When I laser with too less power, it stays a powder. When I go stronger it burns all the powder. I do not really find the perfect setting.